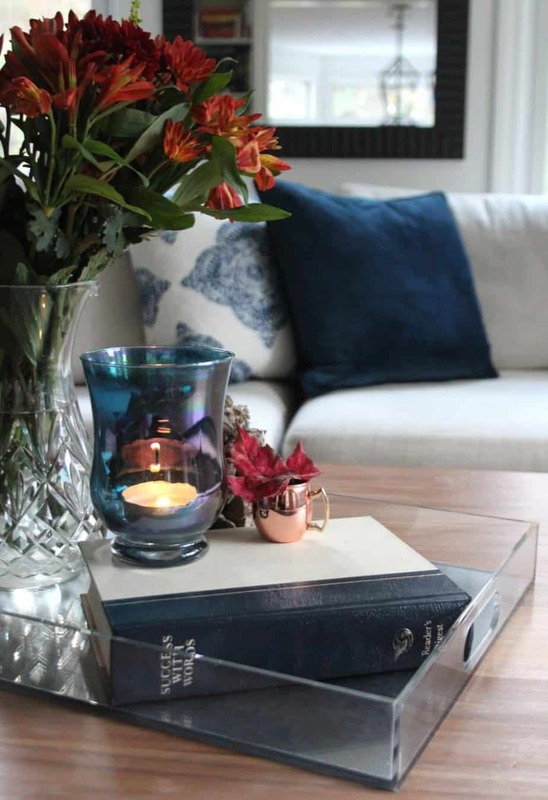 Welcome back to the 4 week house spruce up series! I’m so happy to join a super fun group of bloggers – Becky of This Is Happiness, Shelley of Crazy Wonderful, Julie of Less Than Perfect Life Of Bliss, Katie of Miss Dixie, Jennifer of Dimples & Tangles, and Pam of Simple Details – to bring you ideas and projects to knock out before the holiday craziness hits. 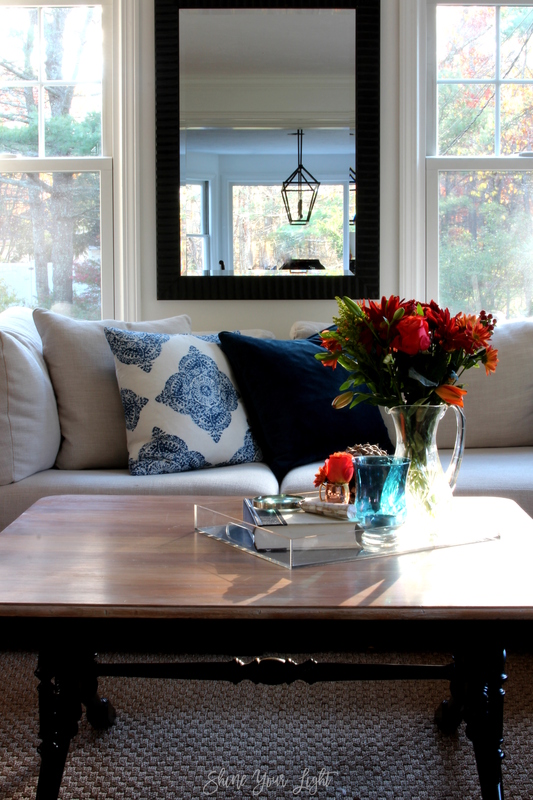 This week’s room is the living or family room and I have a great DIY for you! 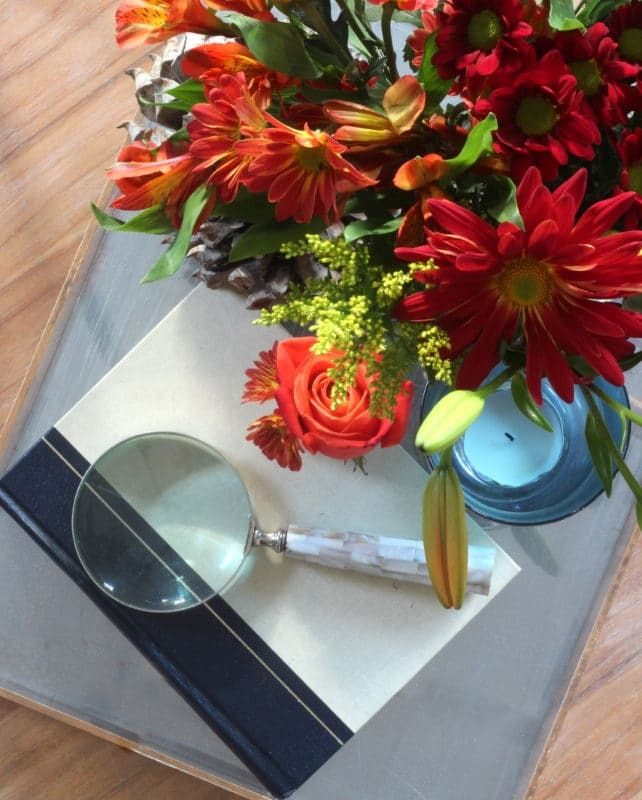 Using a tray on a coffee table is a great way to create a little vignette and coral some pretty items together. Mix in some seasonal flowers or greens, perhaps a little white pumpkin for Thanksgiving or a few ornaments at Christmastime and you’re good to go! 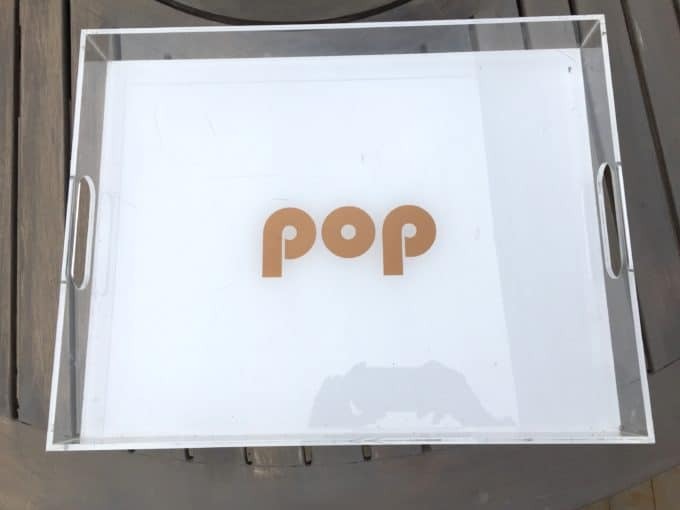 It’s a nice weight, a good size at 13″x17″ and although the white bottom was kind of beat up, that was fine with me because I figured if it marred easily then that text could probably be removed and something interesting done with the bottom, and indeed that was the case! and gold, silver or copper foil, a bright color, or a decoupaged photo (or collage of photos) would be amazing for this project too! So many possibilities! Without further ado, here is what to do – and what not to do!! 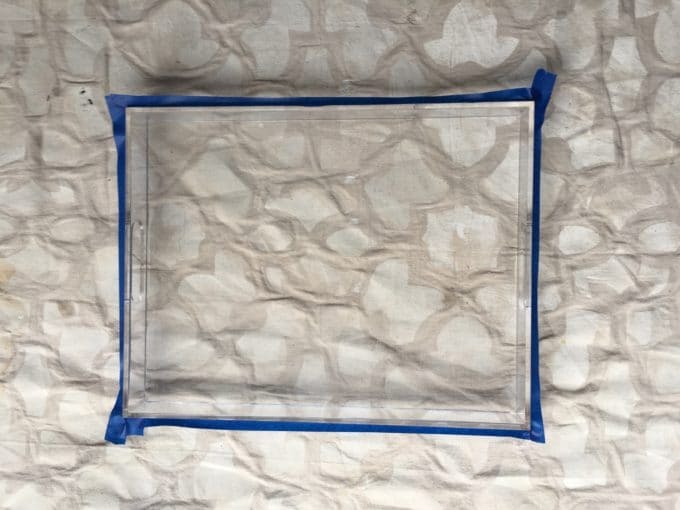 My DIY mercury glass technique did not work on this tray and I’m assuming it’s because of the use of acrylic vs. actual glass. A flat mirror finish works better for this application. The supplies are listed at the end of the tutorial. I tried a couple solvents – paint thinner and Goo Be Gone, which removed the design but only with a lot of elbow grease. Then I tried my favorite furniture stripper, Citristrip, and the white finish starting coming up as I was applying it. Winner! 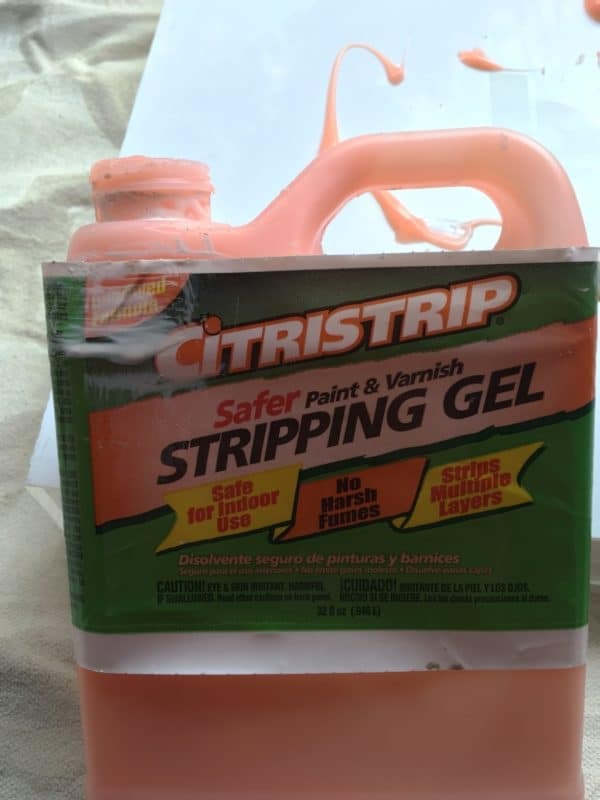 • Despite the label, I strongly suggest using Citristrip outside. Wear rubber gloves and take care not to get it on your skin or clothes. Set up a tarp on your work surface. 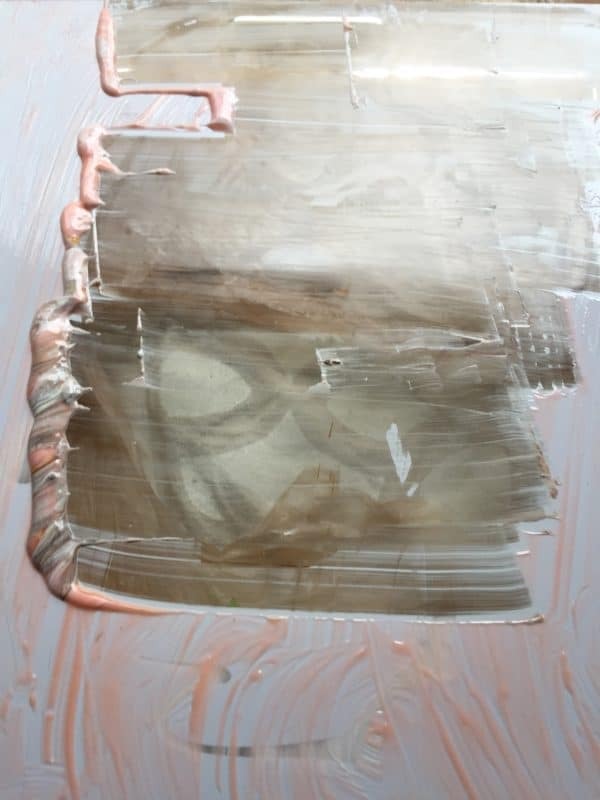 • Apply with a cheap throw-away paint brush (not foam, which disintegrates with the stripper) OR a paper towel or rag. • Give the Citristrip a good 10-15 minutes to really do it’s thing. • MOST IMPORTANT STEP! Wipe off with a paper towel or rag, not a scraper! I removed the finish with my paint scraper and this was a terrible mistake as it left scratches all over the surface of the acrylic. The paint comes off really easily with a rag so the scraper is unnecessary. 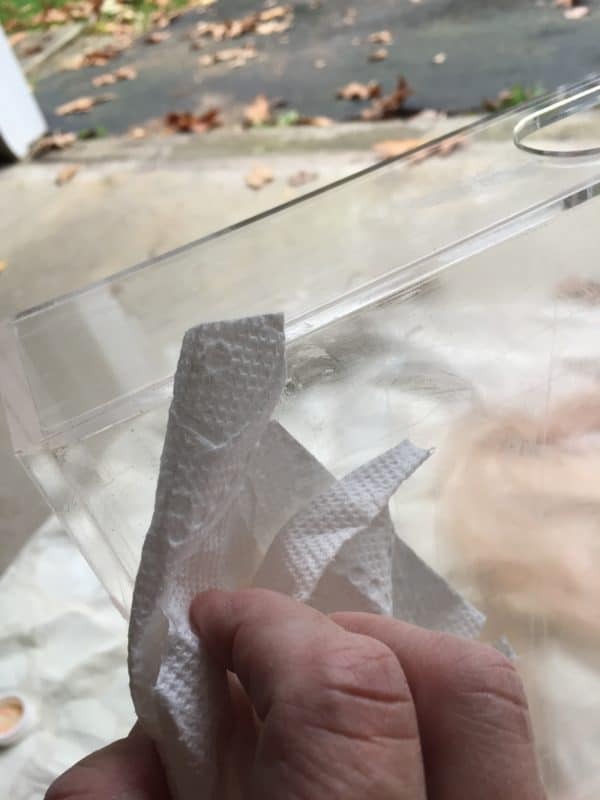 • After removing all of the design, wipe down the excess stripper, then wash and dry the tray. 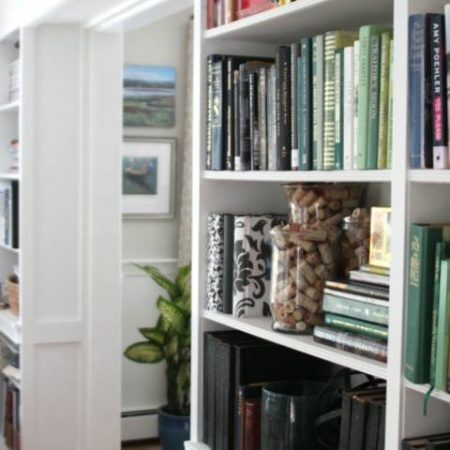 There are so many possibilities of what you could do here! 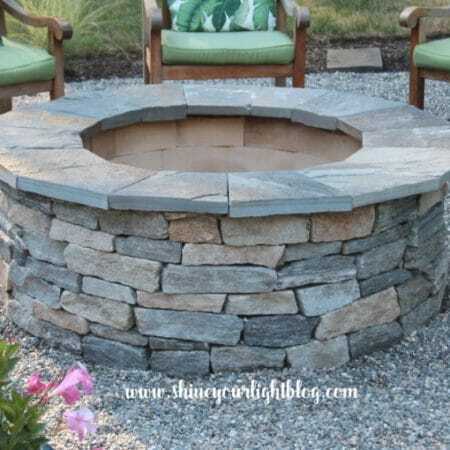 Leave it as is like this gorgeous vignette, or do something interesting to the bottom……there are so many options to make this project your own! Here’s how I gave the bottom of this tray a mirror finish. • First, place the tray face down on a tarp. Tape just the edges of the sides. 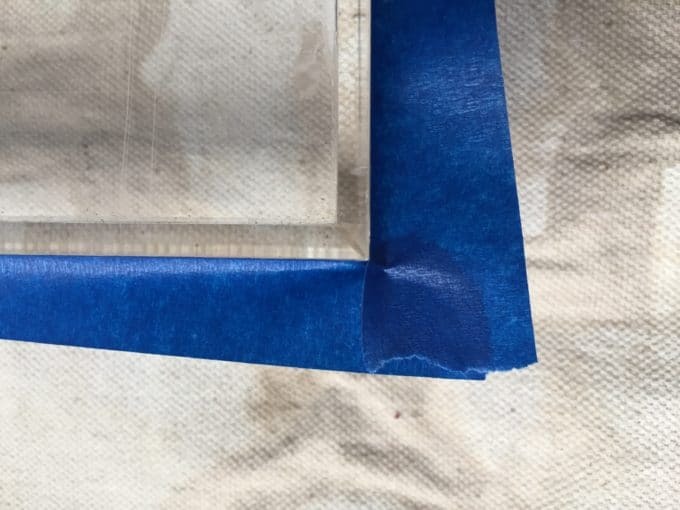 • Fold the tape in half and then open, so the tape catches all the overspray. 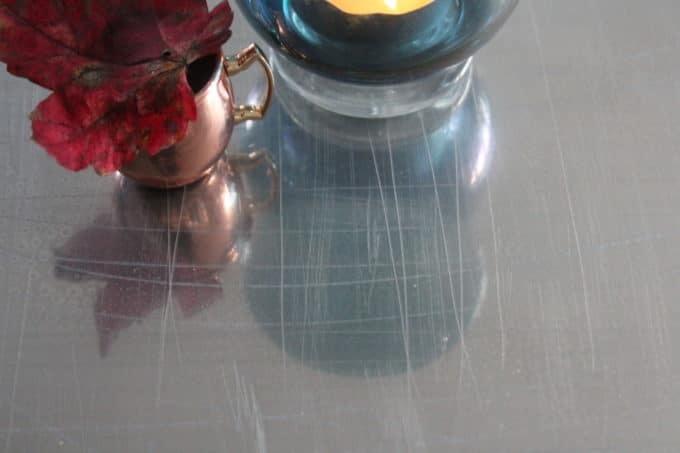 • Spray the bottom of the tray 2-3 times with Looking Glass, allowing to fully dry between coats. Now flip it over and marvel at how pretty it is! The Looking Glass spray really does give a mirror finish! 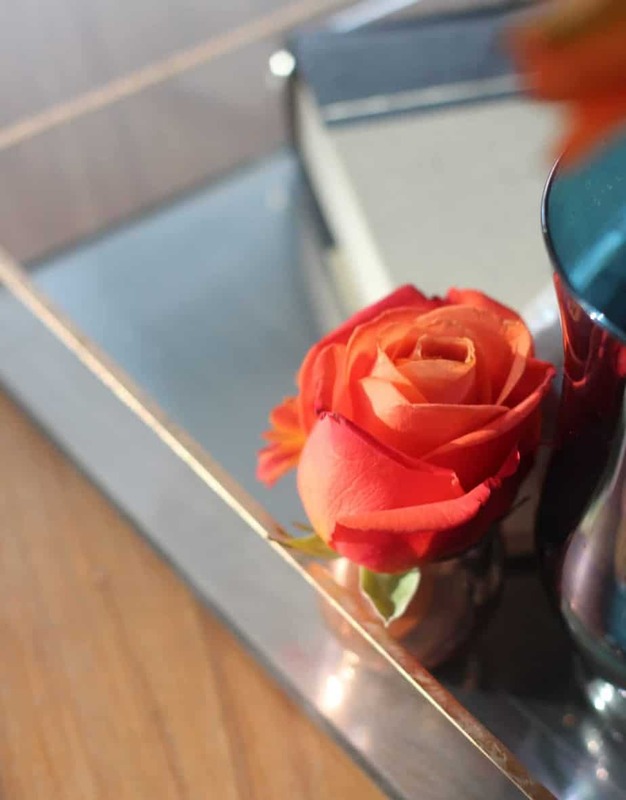 My bar cart mercury glass shelves were made with real glass and they are definitely more reflective – very much like an old mirror. The acrylic is a little more hazy but you can see your reflection. It’s really hard to capture on camera but the light bounces off of it and the flowers are reflected in it. it’s insanely scratched from my scraper! OYYY!!!! But you know what, it’s totally fine because once the tray is all styled up you don’t really notice the crazy scratches. 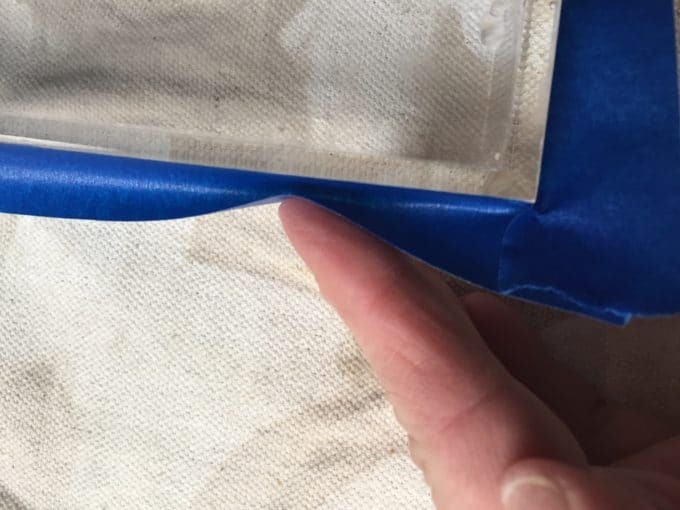 The lesson here is be gentle with your acrylic tray – wipe the stripper off vs. scraping it off. One last detail, and it’s a game changer! To apply the R&B I used my fingertip. You can also use a kid’s paintbrush with the bristles trimmed short. This was a really fun and satisfying project and scratched or not, I think I’ll use this tray all the time (and will definitely be keeping my eye out for another one in the clearance section!) I think it would also be great in a bar to coral liquor bottles, or at a cocoa station, can you see it? I hope you enjoyed this tutorial; keep your eye out for a couple more DIY mirror projects in the near future! 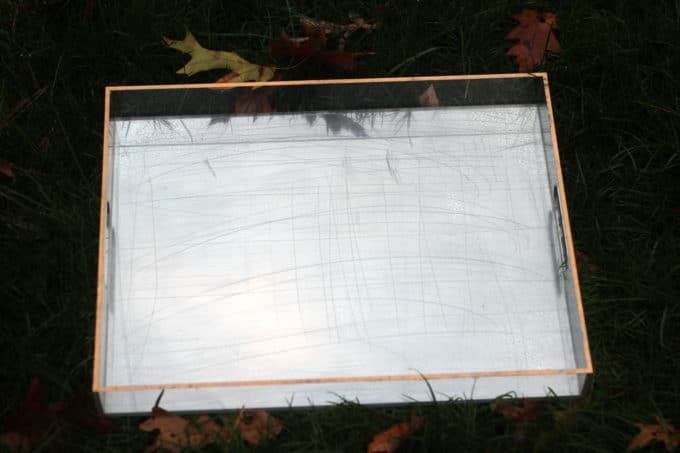 An acrylic tray (minor scratches are okay but look for one that is not too distressed on the bottom). Bonus points if it’s from the clearance section! Let’s see what great tips and projects these amazing ladies have for us! Don’t miss the final post next week all about the dining room, and thanks for stopping by friends! I love how this turned out, Lisa! I’ll have to pin this & keep it in mind! Thanks so much Julie! It’s a fun little project for a $5 tray! What’s a great idea! I always get excited when I see one those acrylic trays and then get bummed out when I see goofy sayings or prints on the bottom. No more!!! Totally going to have to do this! Me too Shelley – they always have something on them that ruins a good clear tray! It’s an easy fix though! Lisa, how cleaver you are. I have never used the Looking Glass spray paint. Will it scratch off the bottom easily meaning you have to be careful moving it around on surfaces? What a great project, Lisa! I actually like the scratches, they look like a cool embossed pattern. Maybe you need to scratch the rest of it up! 😉 Ok, I’m off to add R&B to the top edge of my acrylic tray!! Love! Okay let’s pretend they’re on purpose and part of the design 🙂 I like your thinking! HOW beautiful, Lisa!!! I love a try used like this. I actually got mine with a mirror already in ti from Hone Goods…but I bet I paid a lot more than you did. You are so creative. Thanks so much Mary Ann! 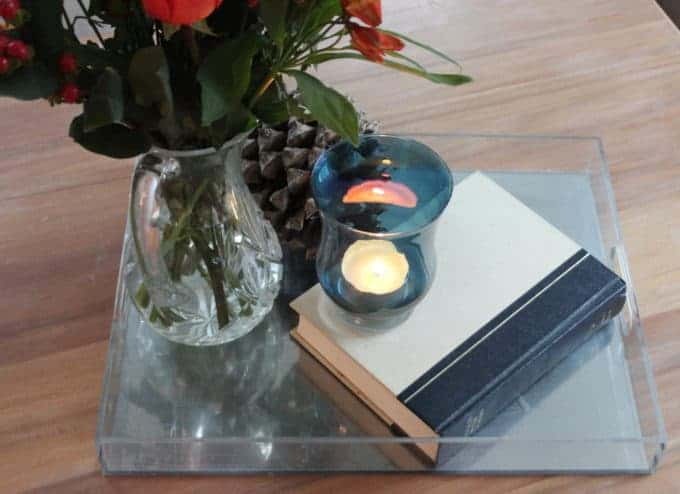 I have a real mirror tray too, a little one about 10″x10″ – I love how it bounces the light around and use it everywhere – such a good accessory to have isn’t it?! 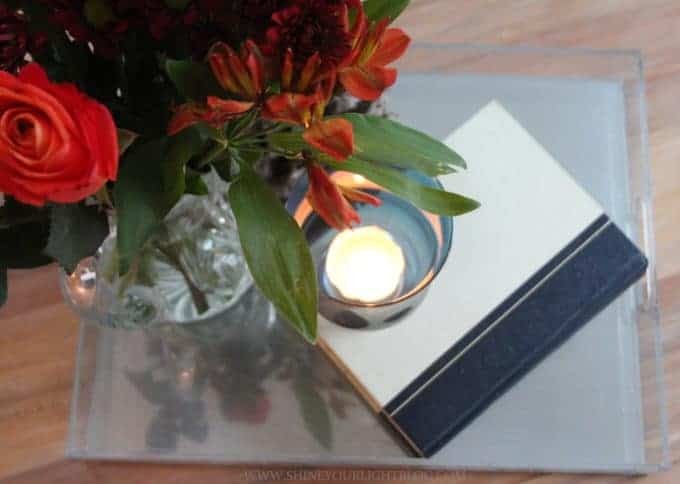 Such a cute idea and that tray will be so pretty with lights reflecting it over the holidays! Rub N Buff is most definitely a game changer, I was dangerous when I first started using that stuff! Everything started to turn gold! ha!! I love the idea! With a good sealant, you can protect the mirror effect! 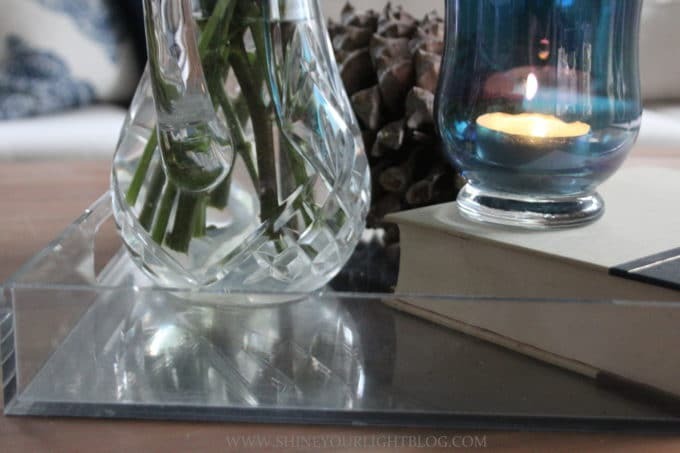 Amazing idea to use this acrylic tray! Yes! I actually have sealant on my supply list, just haven’t gotten around to doing that step quite yet! Trays are the best, love your glammed up version, and that gold edge is so good! I remember you doing another project with Looking Glass, I’ve never tried it, but definitely need to add it to my list! And, those scratches ~ we are peas in a pod!! Haha! 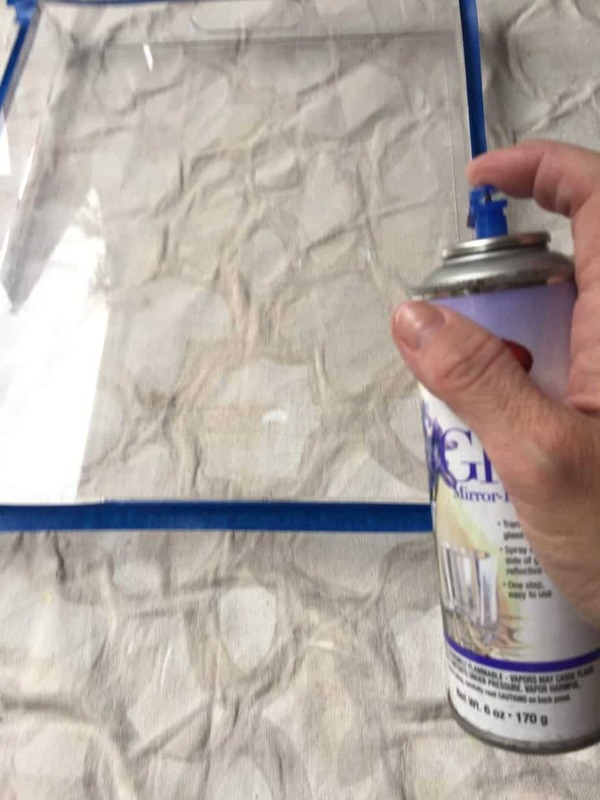 That Looking Glass spray is really fun to try – I can see you transforming something amazing with it Pam! Love how this turned out! So clever. 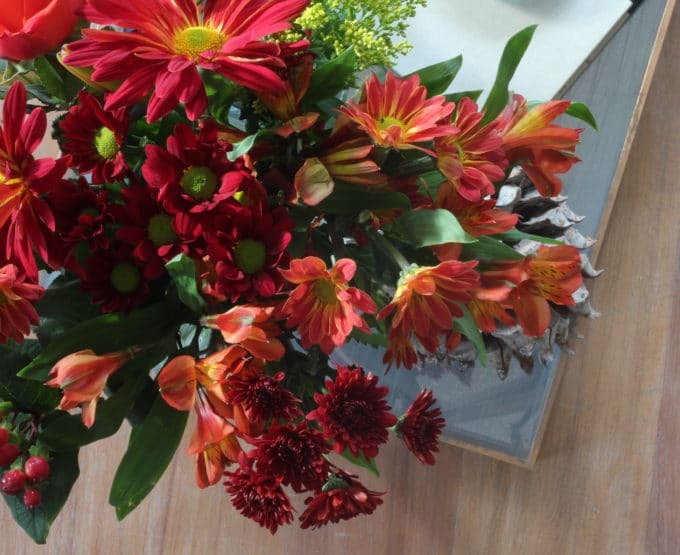 Looks beautiful on your table. Not good news for your laptop… But smells your are too much clever how easily you protect your mirror..